Social Proof is THE MOST COST EFFECTIVE One-Two Punch OF MARKETING FOR FITNESS + WELLNESS BUSINESS OWNERS. With today’s digital consumer landscape moving at lightning speed, the most credible form of advertising comes from people we know and trust who share products and services they love. 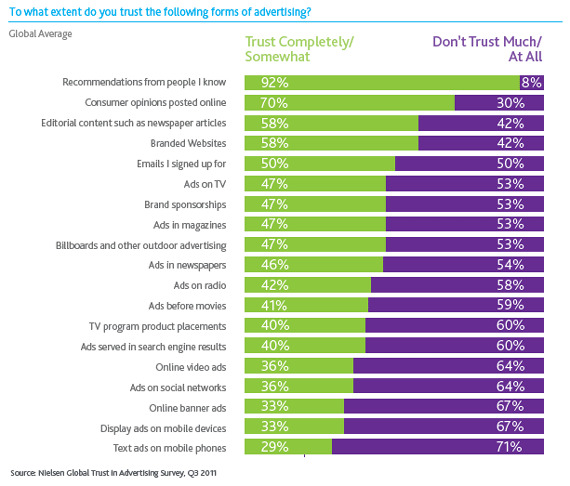 Nielsen has tracked that over 92% of people trust a referral from someone we know and 70% trust a review or referral from another person versus something they read written by the business, even if we don’t know them. Consumers nowadays want proof from their peers and unbiased 3rd parties – not the brands selling the products. One of the biggest bangs for your buck, is spending a little time on word of mouth marketing and using social media and people’s own networks to get you in front of your potential clients. With social media, just about every client and industry contact you have has a network that you can tap into. But, you need to spearhead the process. You want to have your existing customers, clients, early adopters, and superfans, advocate your brand. In their own words, on their own social pages first (of course you will share and promote after they post). You can also curate ‘wisdom of the crowd’, a multi-client testimonial you take in video snippets, at the end of a class, or in some interesting way. I once saw a boot camp style fitness have each person on the last 100 feet of a run say one word that embodied the facility into a camera phone (keep it stready!) the trainer was holding. It felt fun, authentic, and gave you an idea of their wide mix of clients. EXPERT REFERRALS: Outreach to people with reach to your desired audience. Gain approval or be shared by credible experts in a relevant field. This is a ‘long game’ ask and not about you gaining anything in the early days. Find a way to build real relationships with experts, blog writers, and notable people who may feel positively about your offering. Write emails, invite to try your business offerings (maybe even one complimentary session for the more well-known experts), offer up blog post help, a campaign around their fitness goals, and network to offer to support their needs ahead of yours if you don’t have a prior relationship. Let them know you would love their support in the long term, but that you want to know what you can do to help their goals first. This is a GIVE, GIVE, GET philosophy – and although you may ask down the road, you must have no expectation of support in return – so help those you can honestly get behind. CERTIFICATION CREDIBILITY: This is not about asking, it is about the education you have obtained in your industry. A pretty clear cut area for the fitness and wellness world - Certification, Licensing and Accredidation MATTER to your audience. Especially if they don’t know you. Most certifying or licensing companies give you a logo you should display prominently on your website. You will need to put in the time, coursework, passing exam or other practical application hours to have a credible, 3rd party entity which certifies that you are a knowledgeable, high-quality or trustworthy source in some area (e.g. “ACE Certified Personal Trainer, Registered Dietician, CrossFit Level 3 Trainer”). You should actively reach out to current customers, past success stories, one-time clients that with whom you had a solid rapport. Ask people you have supported successfully with your business. Don’t ask your best friend, your family, or anyone else who is in your ‘inner circle’. Chances are their review or referral of you will be so lovely (and lengthy), that it is not believable or comes off contrived. Ask a client you have had for 3-6 months who has seen some success. I tell people they should have five people at any given time who they work well with to reach out to – for referrals, testimonials, and who are also willing to share natural, honest feedback. Ultimately, the people that refer you are the people that help define your new customers. STOP THE NONSENSE of being nervous to ask for help promoting your brand. The more you do it, the more it will come naturally. Come up with a way you can support the other party before you reach out to make the ask – maybe its highlighting their achievements in a newsletter, hold the camera, let them film a short video about your business on site? Make them feel special, without offering a trade of some sort for their testimonial. They must want to say wonderful things about you because you actually helped them achieve goals, they love your product, or have been inspired by you. This is Anna Price, a kickass Prowess client, who founded AP Vitality and has been empowering beauty, strength and wholeness in her California clients for over a decade. She knows that 70% of people trust a review or referral from another person, even if we don’t know them, versus sales copy written by the business. Help your advocate create the referral ad let them know you will share their post from their handles as well. A compelling visual with social proof copy will drive solid engagement. Offer suggestions on how best to capture a good visual or if they want to take an action photo – shots where they are interacting with your product or service exemplify what you are offering, especially if they own a branded item to use in the post. Perhaps you can arrange a photo while working together, or set up a video call and take a screen shot of both of you in action? Even better, show them how to do a video testimonial. Tag your business handles in all posts! A note on video: This is the how you get more attention on social channels now. There are tons of easy to use video apps that you can use to edit photos and video together. If you are not local to your client, have the person send you 2-3 video clips of them speaking about your work to edit and return. Those agreed to referring your biz may also need a little education or guidance around how to best craft a post. Prepare some thought-starter questions to send to them. Review their content copy and nail down the compelling image together if needed, show them how to post on their networks, how to tag your business, and any other tools they may need. Give them the space to share their story. Down the road, re-share their social proof on your channels to showcase the stories behind the stellar work you do and what makes you stand out to your network. All it takes is one client that you’ve worked with for 90 days or more. If you choose to have a small starter base of customers or clients for 90 days, and work hard to solve their problems or give them incredible return on their investment – they will become your first round of social proof asks. The reality is that your consumer or potential client is not your opponent, they are your ally and someone whom needs your work to uplevel their own, (and vice versa!). The more experience you build for each other together – the more mutually rewarding the relationship will be. Use the authenticity of social proof to reach those that are ready to hear your offering. SKIP PAID SOCIAL PROOF IN THE EARLY DAYS. As you build more relationships, you can always set up a referral program with people who have great reach than you do. SO >>>>What’s the ONE-TWO PUNCH? #2 Crafts content for BOTH parties to share, and can create a mutually beneficial ongoing relationship. You remain invested in each others’ goals. SOCIAL ACTION ITEM: Connect with 5 people over the next week whom you have worked with, past clients, current consumers, the members of your business following that you know well enough to ask for social proof. Write them each personally. Follow up with a call a few days later. Get and support the final post and share your story! Speaking of sharing, would you be so kind to share this with friends + connections + fitness and wellness entrepreneurs?